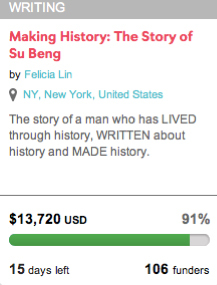 On December 10th MAKING HISTORY hit 91% of its funding goal. Nearly 10% of the campaign fundraising goal was contributed in 24 hours! It was incredible to witness as I was on Facebook and posting things on my social media channels. Needless to say, there were some extremely generous contributions that came through that day! A HUGE THANK YOU to everyone who has supported this campaign and contributed so far! If you haven't already contributed, this is your chance to help push this campaign to the finish line! There are 14 days left for me to reach my goal!